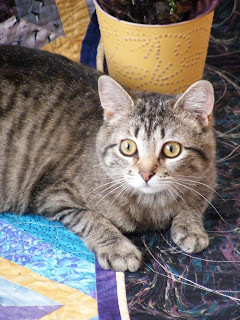 Elsie M. Campbell and Aunt Mimi's Quiltworks: Sally has a sibling! Saturday afternoon, and I was headed out to get groceries, and try out my legs after several weeks of Physical Therapy for my back, and there he was.....just sitting on my fence looking at me. I stared in disbelief. I thought I was looking at Sally the Cat, only in a different colorway. (Describing him this way for my fabric fans.) This cat was a softer shade of gray, with the same familiar beautiful face, and markings, only he has a white underside while Sally's is red, like the color of a squirrel. Sally the Cat and Gianni S. Kitty He came when called, allowed me to pick him up, and was he ever hungry! I took some food out to him, and hollered at Ken to come and see what I'd found! He couldn't believe what he was seeing, too. 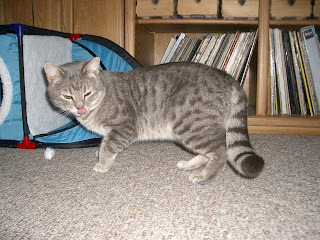 This cat was way too similar in appearance, size, demeanor, not to be very closely related to our Sally. (Sally showed up in our back yard just about a year ago.) We've decided that this cat was probably her brother, most likely a litter mate. Ken immediately dubbed him "Gianni Schichi" after the main character in the opera he was listening to at the time. I've since changed it a bit to Gianni S. Kitty. We brought him in, and he played for awhile. 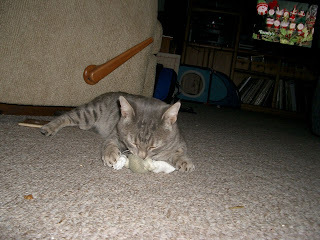 He especially liked Sally's catnip sock that I'd made her. I went on to the store. While I was gone, I guess Gianni got a little too rambunctious and decided he wanted back outdoors, so Ken let him out. I was a bit disappointed when I got home, but like Sally, I figured if he was there the next day it was meant to be. He showed up at our door about 8 pm yesterday evening, so that was it. We have a second kitty, same as the first. Do you remember the Smothers brothers? "Second verse, same as the first. A little bit louder and a little bit worse?" Apparently, that's about what we have here with the second kitty. Gianni spent the night in a kennel. I just couldn't trust him to have the run of the house yet, especially since he has nasty claws, and knows how to use them. He still wanted out this morning, but I had other plans for him. He went to the veterinarian this morning, where he will spend tonight. Surgery is scheduled for tomorrow. I consider neutering an essential part of responsible pet ownership, and this little kitty would be a prime candidate for being ripped apart next month at the beginning of the mating season for cats without it. My vet also reminded me that before we do anything else, he should be tested for feline leukemia and FIV. There is no cure for either disease, and if he tests positive, there is will be no reason to go ahead with anything further. I really hate the thought of that possibility, but I know my veterinarian is right. Sally was very interested in him last night, approaching Gianni cautiously. She followed him as he moved about the house, but wasn't sure she wanted to get too close. Integrating another full-grown cat, especially a full-grown tom cat, one that has been living as a ferrel cat in our alley for probably a year or more, may prove to be challenging. I think they will get along well, once we know he will be here to stay. Have any of you ever taken in a fully mature cat? Any suggestions for us? I think Miss Sally would love to have someone to play with, and I would enjoy a break from having to keep wiggling things for her entertainment. Wish us luck in welcoming Gianni into our household. Wishing you lots of luck Elsie! Looks like Santa came to your house a bit early this year! Enjoy! Gianni got a clean bill of health from the vet. He came home today, and is resting peacefully in the bath adjacent to my studio. He's pretty sore, which is to be expected, but he'll be up and going in a few days. I'm happy to have him and am hoping the cats will adjust quickly to each other's presence.